A job in the outfitting and guiding industry is one of the most exciting and self-satisfying careers today. Backcountry recreation is growing at an amazing rate, and so is the need for qualified guides. 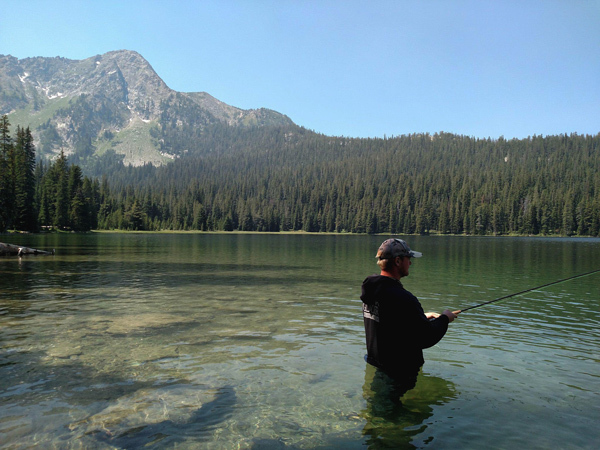 The Royal Tine Guide School, is located 17 miles west of Philipsburg, Montana, along the headwaters of the famous Rock Creek River. The school was developed as a result of the demand for guides equipped with more than luck and a few good stories. When you graduate from Royal Tine you will not only have a more comprehensive knowledge of your profession and everything that goes into the outfitting business – you will be in demand! You will receive instruction in the following four areas: horsemanship/horseshoeing, horse and mule packing, outdoor/woodsmanship skills, and guide/hunting skills. Experts are provided in specialty areas to give you the benefits of a wide range of experience. The last part of the class will be spent on a pack trip where you will put your new knowledge and skills to use. We are limiting our enrollment to a maximum of eight students per program, so there will be ample time for individual attention. This camp is the real thing! There is no running water or electricity. Facilities will include: a kitchen tent, tents for students, and other tents for equipment, tack and crew. Here is your chance to make dreams of an outdoor career come true. If you are serious about guiding and packing, then join me for the best time of your life! I look forward to sharing my love and knowledge of the outdoors with you. For references or questions, call 406-859-5138 or email royal_tine@yahoo.com. 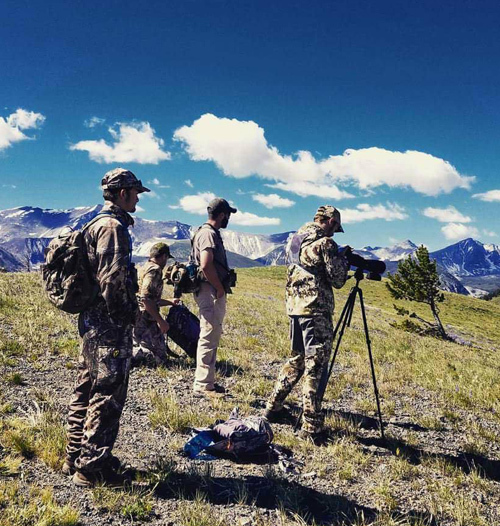 Our flagship class is designed for hunters and outdoorsmen who want to learn the skills to become employed as hunting guides and/or packers for Western big game hunting outfitters. These outfitters rely on good stock and good employees to get their hunters and gear into prime remote hunting camps. The highlights of Royal Tine’s curriculum include: extensive elk hunting instruction (including tactics for both archery and rifle scenarios) as well as mule deer, bear, mountain goats and bighorn sheep, basic horsemanship, extensive horse and mule packing, big game animal habits and habitat, trophy animal scoring and field judging, 1st aid & CPR certification, game animal field care, map, compass and GPS navigation, wilderness survival skills, tracking wounded game, big game guide ethics and morals, wall tent camp set-up, and basic camp cooking. The class is rounded out by putting all your new skills together by packing up your gear and taking a back-country pack trip the last week of class. The more skills and knowledge you have, the more employable you will be in this business to an outfitter and your chances of a higher wage increase. We assist in job placement for qualified graduates. Applicants for all guide and packer classes must be able to lift at least 80 pounds chest high. It is imperative that you lose any excess weight and get into shape for this line of work. We have a weight limit restriction of NO MORE than 250 lbs. If you smoke, QUIT!!! How many times have you wanted to ride into the backcountry for several days to hunt or simply enjoy mother nature, but didn’t know how to undertake this “monumental” task? This short class will give you the skills to do just that. This class is for both beginner or intermediate packers. 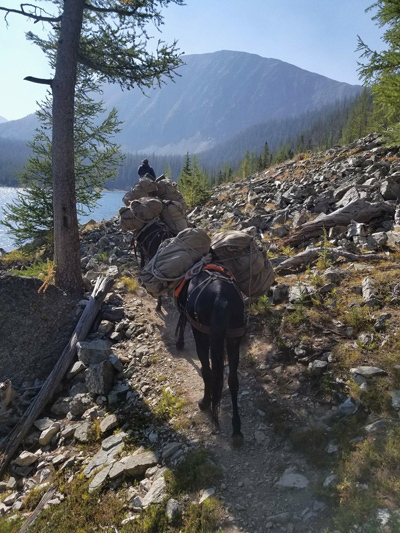 The class will include lots of hands on packing with gentle mules as well as lecture type sessions where you’ll learn important tips on how to have a fun, safe and successful pack trip. Classes are small so you’ll have lots of personal time with us, your instructors. Special requests and questions are welcome. Whether you have packed a lot and are just looking to improve or whether you have never packed at all, this class would be beneficial to anyone looking to learn or improve their skills. Classes are held outside of Philipsburg, MT in the foothills of the Anaconda Pintlar Wilderness. Lodging and meals are included. Students stay in wall tents with a wood stove and comfy cots and foam mattresses. All meals are hearty homestyle, just like in the backcountry. At the end of the class we will put some short strings together with various loads and go for a ride. For dates, prices and application visit our Dates and Prices page. Note: you will be staying in wall tents for 3 days, so bring any items that will make your stay comfortable and enjoyable. 406 Precision and Royal Tine have partnered up to create a premiere long range shooting course in beautiful Philipsburg, MT. The class is for shooters hungry to stretch their equipment to its fullest potential. Throughout their stay, students will receive a mix of classroom instruction and field shooting experience mimicking live hunting setups. Bring lots of ammo! Areas to be covered in class include proper rifle set-up, creation of custom drop charts, effective shooting form, information on field set-up and collecting environmental data, terminal ballistics, and much more. We encourage you to bring your own equipment capable of shooting out to 800-1000 yards. If you do not have an adequate system, a limited number of 406 edition Snowy Mountain Rifles are available. If a top-level learning experience isn’t enough, the three-day course will also be held at the stunning riverfront property of the Royal Tine Guide School. Lodging and meals will be provided in a hunting camp atmosphere—sharing stories by a snapping fire with a belly full of Dutch-oven deliciousness will complement each day’s tactical instruction. Ladies, we have accommodations available for you, too, and we heartily encourage you to come out and hone your long range skills as well. If you do not have a shooting system available we have a select number of 406 Precision edition shooting systems for use in the classes for an additional fee. 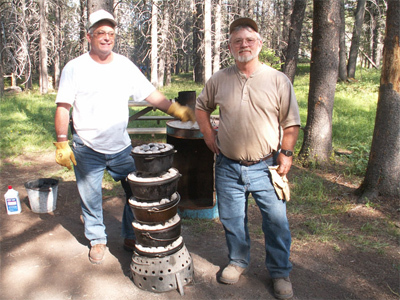 The two week course is an elite outdoor cooking course and is recommended to anyone seeking an extended education vacation and/or job placement as a camp cook. This outdoor cooking class teaches cooking and baking techniques using cast iron (Dutch Ovens), propane ovens, over a campfire & campfire coals, and in an earthen pit. We also cover baking breads and sourdough basics. You’ll learn menu planning, time saving tips, and cooking for larger groups of people. If you want to learn outdoor cooking skills, new recipes and techniques, then this class is for you. Be sure to check out pictures and videos from the course on our gallery and video pages. Royal Tine’s Camp Cook School was featured on the Food Network! These classes are educational mini vacations. You will learn to cook and bake with cast iron. Accomodations are very comfortable in wall tents in a camp in the foothills of the beautiful scenic Anaconda Pintlar Wilderness. Contact us for specific information and requests and have a look at the links above for an idea the class, as well as our Photo Gallery. When the guide school is not in session, we offer photo safaris, horseback trail riding, and pack trips to scenic mountain and wilderness locations. Contact us regarding the possibility of your custom single day trip or multiple-night mountain horseback camping adventure.